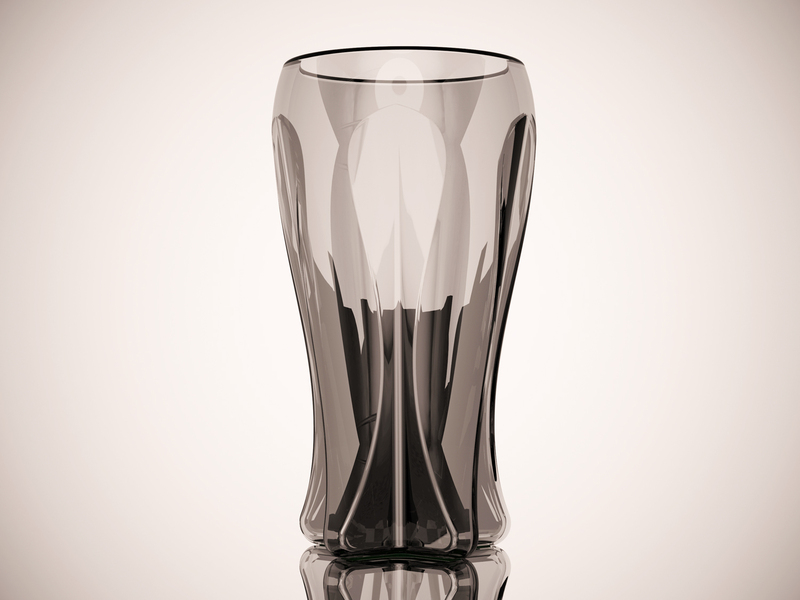 gianni renda’s beer glass: drinking for the no longer young | Abler. 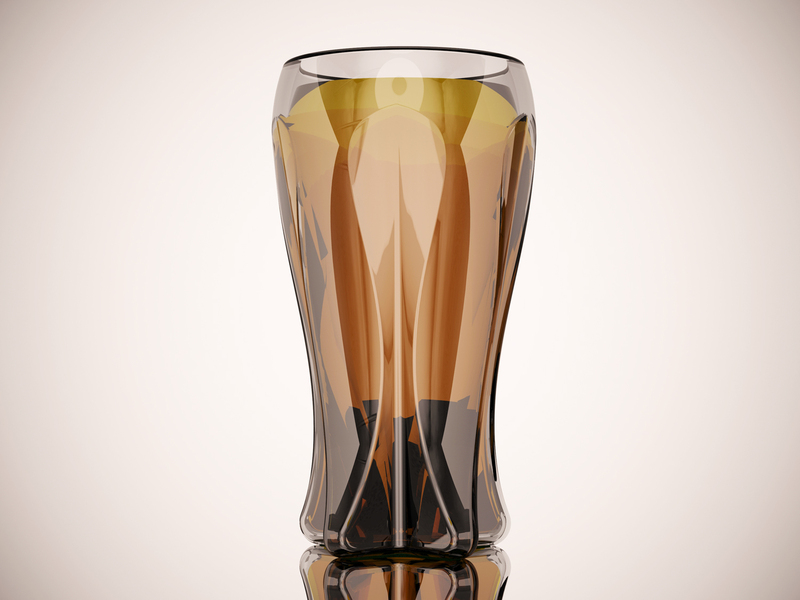 Designer and researcher Gianni Renda has designed a beer glass that’s age-friendly: it’s got a grip-enhancing shape, eliminates condensation and features a no-slip base—a design that’s subtly targeted for users with less-than-steady handling or weakened muscles or joints. Renda’s also a scholar interested in aging and assistive cutlery, especially how design choices can shape technology adoption. He’s now a research fellow and lecturer in industrial and interior design at Swinburne University. I emailed with Renda about the product, his interest in design for aging, and what might be learned from giving greater design attention to these everyday products. Abler: Walk us through the design of your glass. Renda: This design was a response to a competition brief, where the charge was to design something around beer for the 60+ market. It could have been a new type of beer or a product that aided its consumption. I’m a beer fan (and also a stickler for tradition) so I decided on creating a vessel that would allow consumers—irrespective of their age—the ability to securely grip and enjoy their beer. 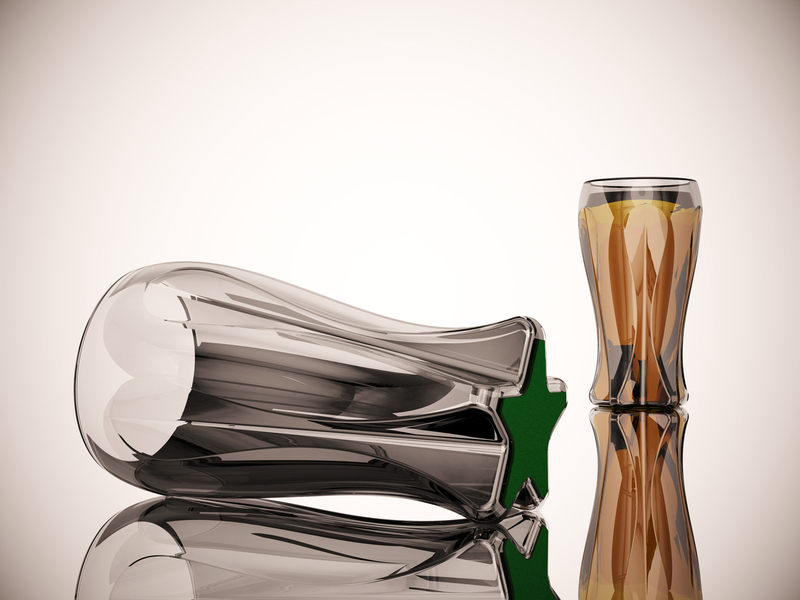 While the glass is only a concept, the features that I included in its design are technically feasible. I knew that I wanted to limit condensation on the outside of the glass, provide a stable (and, if possible, non-slip base) and to create a strong visual aesthetic that transcended any sort of perception of disability. The first step I considered was the aesthetic: how could these features be implemented? I did some research into existing glassware and other forms of stemware to get inspiration but finally arrived at this star design. By vertically transitioning from the star to a circle, I was able to integrate channels along the glass that would promote grip. To verify this, I did a scaled prototype using a Makerbot and did some very low-level user testing amongst friends and colleagues. The twin wall design has been used by many companies, most prominently Bodum. Their coffee glasses keep the coffee hot for longer, but due to the insulating barrier of air between each wall, they are cool to touch on the outside of the glass. It also works in reverse: if the contents of the glass are cold, they will remain cold for longer, but will not condensate on the outside of the glass or be cool to touch. This feature is quite important for my concept. By reducing condensation on the outside and making the glass room temperature, it will be more secure in the hand. The other added benefit is that the beer won’t get warm as quickly; it gives the user more time to savor the contents. The final element was the non slip base. 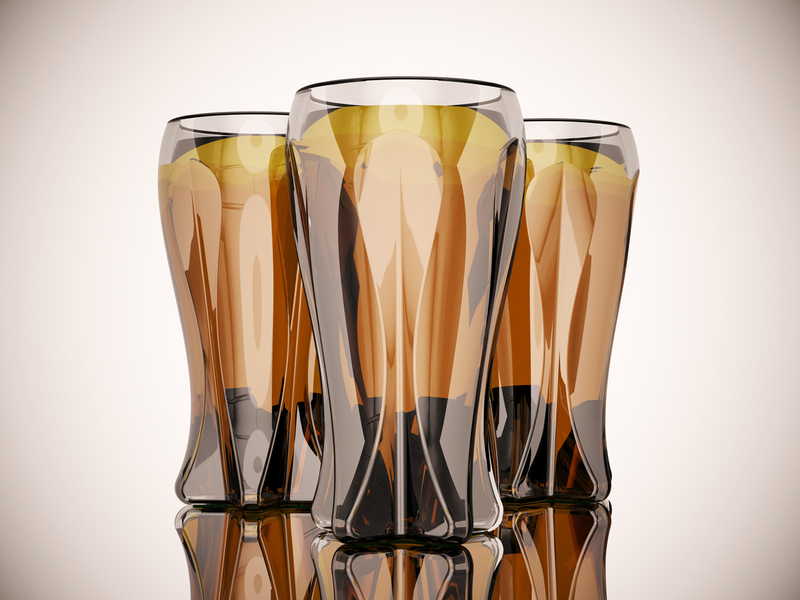 All twin wall glasses have a small silicone stopper at the bottom to drain the condensation out. Instead of making this discreet, I chose to enhance this and make it more functional. There are many glasses that have a silicone base that are non-slip, so adding this to my concept seemed logical. Abler: How did you get interested in assistive cutlery? It’s one of these low-tech areas of research that I love, precisely because the tools are so critical and ubiquitous, and because using them is so key to one’s sense of order and habit. Can you talk about this work’s origins in your own practice? Renda: My interest in assistive cutlery began some time ago. My mother has rheumatoid arthritis, and while it isn’t particularly severe, the occasional flare-up causes her discomfort in her hands. One of the things that struck me was that while there was a series of ergonomic and aesthetically pleasing products designed around food preparation, such as vegetable peelers, storage containers and the like, products designed for actually eating, such as assistive cutlery were seriously lacking. To me, that didn’t make sense: why would there not be a set of comfortable, attractive pieces of cutlery to use on the table without feeling self conscious? That in itself raised many questions around the importance of the aesthetics of the pieces. The visuals are equally as important as the ergonomics of the product. This eventually turned into an industrial design honors project, which then turned into a PhD, where I investigated the stigma surrounding assistive cutlery in depth. Abler: It seems like now, instead of merely medicalizing conditions of aging and treating them with drugs, clinical settings are also looking at much more environmental and holistic supports for those changes. And it seems like prolonging a person’s sense of “normalcy” and dignity, in the forms of everyday tools, would be key to that environmental support system. Are you self-consciously identifying with those ideas? Renda: The design of rehabilitative spaces as a whole is becoming more and more important. It’s a slow process, but people are beginning to see that design as a discipline is more than just pretty pictures and styling—it’s also about the interactions we have with a space or a system. Your point on “normalcy and dignity” really is the key issue I deal with in my research. We are all going to age; how well we do so is in some ways, up to us. But there are external factors that are beyond our control. I would like to think that when I am old and if I don’t have the full function of my body, I would like to still be in an environment that makes me feel good. I’d like to think that by the time that I’ll require living aids, I’d be able to get a cane, hearing aids, orthotic shoes, etc. that enhance my life without the appearance of being disabled. I think the future is really bright in this area and I’m excited to be a part of it. Abler: I’d be interested in hearing your further thoughts about “without the appearance of being disabled.” I think a real living tension—a good, productive one—in assistive technologies is about this issue. Is it hidden tools that we’re seeking? Or tools that make bodies “pass” as normal? Or can our tools also do some of the work of investigating our received notions about who counts as normal or abnormal? I’m interested in that kind of friction—not just the “smoothness” created by better designs, if that makes sense. Renda: Think about clothing. Some people wish to stand out and wear quite bright or outlandish pieces, but others will want to blend in. The one thing that I wish to achieve with my research is to find an appropriate middle ground. Too many assistive devices have an outwardly medical aesthetic—even in their materiality, they come across as unsophisticated and sometimes crude implements, despite having had countless hours of R&D go into them. The advances in manufacturing that have come about in the last few years, however, allow product designers to tailor to the client easily, so if the client wishes to blend in and have a product that is seamless in their environment, that’s possible. Conversely, if the client wishes to stand out, that’s also possible. Prosthetics are an incredibly exciting example in this area right now; people are embracing the rapid manufacture/3D printing revolution and really pushing the boundaries of form and function. I think this is an area where the “friction” between blending in and standing out has been most apparent. Quite a lot of prosthetics fall into the “uncanny valley,” and while they are (in some cases) very, very close to replicating the human form, some members of the population get a little uncomfortable around them. Some designers are starting to explore the possibilities of form that can be created. That work isn’t hiding the fact that the person has a disability, but actively embracing it and turning it into a positive. Abler: Tell us more about your current research efforts. Renda: I’m really focused on the physical issues surrounding aging: mobility, dexterity, visual acuity and so on. The reason I find this area the most interesting is that it isn’t age-specific. Signage and wayfinding should be easy to read, interpret, and be visually appealing for everyone. Handles and grips should give you a sense of security, instead of a “will this really hold my weight?” or “is this going to shatter in my hand?” I get quite excited by all of this. The limitations and regulations around these areas should be viewed as opportunities for innovation, much like they are in Formula 1, where engineers and designers find very novel approaches within an incredibly strict framework. The other aspect of my research is advanced manufacture. We’re really in the second industrial revolution, and it’s an incredibly exciting time to be an industrial designer. What’s really interesting to me is how we’re transitioning within this time; if you were to look on Thingiverse (a online, 3D model warehouse where everything is open source), you can see that people are experimenting with forms and trying to push the technology to its limits. Because it’s quite affordable, people aren’t afraid of making too many mistakes and learning from them. The other aspect is that for many products now, you don’t need to go to tooling to produce a durable, plastic part, so you can affordably make very low volumes of products without breaking the bank. My hope is that this leads to a rise of the “designer-craftsman”—where if you need a walking cane that’s specifically tailored to your gait, it can happen affordably, easily, and is aesthetically pleasing. More about Gianni Renda found here.